Éric Tymoigne is an associate professor of economics at Lewis & Clark College who specializes in the fields of money and banking, monetary theory, and financial macroeconomics. He formerly taught at California State University, Fresno. His current research agenda includes the nature, history, and theory of money; the detection of aggregate financial fragility and its implications for central banking; the coordination of fiscal and monetary policies; and the theoretical analysis of monetary production economies. He has published in numerous academic journals and edited volumes. His most recent book, coauthored with L. Randall Wray, is The Rise and Fall of Money Manager Capitalism: Minsky’s Half Century from World War Two to the Great Recession. 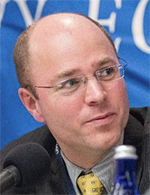 Tymoigne holds an MA in economic theory and policy from the Université Paris–Dauphine and a Ph.D. in economics from the University of Missouri–Kansas City.